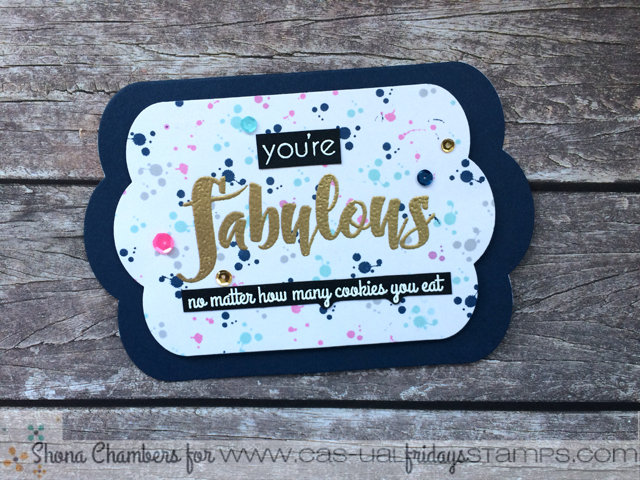 CAS-ual Fridays Stamps: Your Fabulous!!!!! Hi there everyone, its 'Girl Friday' Shona here with a fun card for all your 'cookie-lover' friends and family!! I used some small stamp images from the Bomb Diggity stamp set, along with four ink colours to randomly stamp a messy background. Even my accidents with getting blobs of ink on the cardstock blended in!! I then used the 'fabulous' from the same stamp set and sentiments from the Sassy Smiles stamp set to create this cheeky and oh so true statement. The more cookies you eat, the more fabulous you are I say. I even got out of my 'rectangle card-base' rut by shaping this card with dies from the Bubble Box Fri-dies set!! To find out exactly how I put this card together, pop over to my blog to get the details. And don't forget we still have some fantastic stamp sets and dies in our SALE SECTION that are down to $5.00 each!!!! What a bargain! Thanks so much for stopping by and I'll see you back here again very soon! !